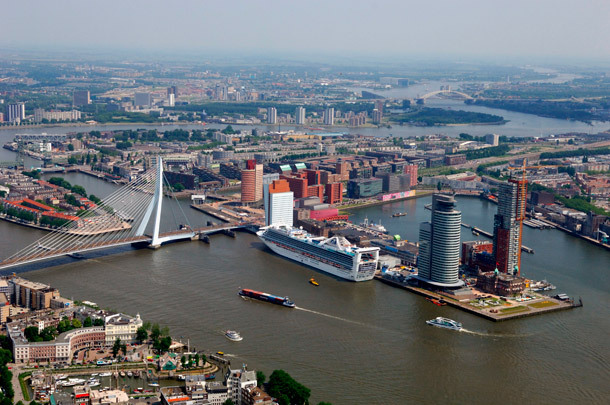 The restructuring of the former docklands at Kop van Zuid saw Rotterdam city centre extend in the 1980s across the river Maas to the south bank. The ambitious programme is for some 5000 dwelling units, 380,000 square metres of offices, 50,000 square metres of leisure and cultural facilities and 3500 square metres of retail space. Largely through the efforts of Riek Bakker, the then director of Rotterdam Town Development, the project, masterplanned by Teun Koolhaas Associates, is now nearing completion. The programme broadly divides into two rows of development, Wilhelminapier and Spoorweghaven, which meet at right angles. An open office development has transformed Wilhelminapier into a 'Manhattan on the Maas'. The largely filled-in Spoorweghaven and the quays along it have been designed as a residential area. Sited at the juncture of the two rows are a clutch of large-scale public facilities, amongst which Wilhelminahof, the new Luxor Theatre and a new metro station. The quay at the approach to the Erasmus Bridge and the bridgehouse were designed by Bolles+Wilson. The area around Entrepothaven is allocated for housing and recreation, the harbour basin itself being given over to yachts. Following construction of the Stadstuinen housing, the strip between Laan op Zuid and Spoorweghaven is being developed with office buildings and Hans Kollhoff’s De Compagnie housing complex. Dam & Partners’ Maastoren is the Netherlands’ tallest office building.